If you've gone to all the trouble of choosing the best Canon camera, you need the right lenses to go with it. Whether you’ve outgrown your kit lens and are looking to upgrade your system, or just want to take your photography in a new direction, you'll find all the best Canon camera lenses right here. Whether you're using a DSLR or mirrorless system (find out more about DSLR vs mirrorless in our handy guide), a crucial advantage of any EOS camera is that the lenses are interchangeable – you can select the ideal type for any shooting scenario, and swap the lens on your camera in a matter of seconds. Of course, that can make the choice of lenses on offer can feel a bit overwhelming. With Canon producing some of the best DSLR and best mirrorless camera models on the market, it unsurprisingly also makes a mighty selection of lenses for its EOS cameras. They range from very affordable, entry-level options to top-flight lenses that cater to the world’s most discerning professional camera shooters. There’s no shortage of different types either, with everything from landscape-friendly Canon wide-angle lenses to massive Canon telephoto lenses, and specialized options like fisheye and tilt-shift lenses in both EF and EF-S mount fittings. So how do you pick the best lens for you? Which Canon camera lens should I buy? The actual lens you need depends on what you like to shoot. For most of us, a standard zoom lens that stretches from wide-angle coverage to a short telephoto focal length will be the go-to option for everyday shooting. When it comes to additional lenses, the most popular choices include a telephoto zoom for shooting sports and wildlife, and an ultra-wide-angle zoom for landscapes, cramped interiors and the wow-factor of exaggerating perspective. Another popular add-on is a prime lens with a wide aperture rating – ideal for blurring the background in portraiture. Here, we’ve picked 10 categories of top-class lenses for your Canon camera. They’re all firm favourites, with real mass-market appeal. In each case, we’ve pick a standout Canon camera lens that delivers superb all-round performance, excellent handling and gorgeous image quality. Value for money is also on the agenda, so if independent manufacturers like Sigma and Tamron make a lens that’s practically as good as an own-brand Canon, but much more affordable to buy, that would be our top recommendation. Indeed, some of the latest independent lenses beat own-brand alternatives for performance, regardless of price. 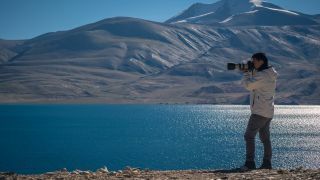 Even so, top-performance Canon camera lenses are often very expensive, so we’ve also picked out the best budget alternative in each category. One thing to bear in mind is compatibility. You can use full-frame camera lenses on Canon’s APS-C camera bodies, but not the other way around. That’s because APS-C-format lenses can’t physically be mounted on full-frame cameras. Full-frame-compatible lenses are classified as Canon EF, Sigma DG and Tamron Di. APS-C format lenses are designated Canon EF-S, Sigma DC and Tamron Di II. Read on for the best Canon lenses you can buy right now. The Canon EF-S 17-55mm f/2.8 IS USM lens is the only APS-C format standard zoom with a fast and constant f/2.8 aperture. It’s ideal for retaining fairly fast shutter speeds under dull lighting conditions, as well as for gaining a tight depth of field when you want to blur the background. It’s much sturdier and better built than Canon’s kit zoom lenses, although it still lacks the weather-seals found on most of Canon’s top-range L-series lenses. The ultrasonic ring-type autofocus system is fast and accurate, and comes with a focus distance scale that’s generally lacking on kit zoom lenses. Originally launched back in 2006, the lens has an old-generation Image Stabilizer but its 3-stop benefit is still very much worth having. Image quality is very good, with impressive sharpness and contrast even when shooting wide-open, along with fairly minimal distortions and colour fringing. It’s simply the best standard zoom on the market for Canon APS-C-format cameras. The Canon EF 24-70mm f/2.8L II USM is the choice of many professional photographers around the world, but it’s not particularly good value for money and lacks image stabilisation. This Sigma lens, the Sigma 24-70mm f/2.8 DG OS HSM | A, isn’t as fully weather-sealed as the Canon, but it’s beautifully built and matches the Canon for all-round performance and image quality. Sharpness and contrast are spectacular, while bokeh is lusciously smooth. Autofocus is very quick and extremely quiet, while the 4-stop Optical Stabilizer helps to ensure sharp handheld shots at relatively slow shutter speeds. At around two-thirds the price of the Canon lens, it’s a much better buy. A major upgrade over Tamron’s original 10-24mm ultra-wide zoom for APS-C format cameras, the Tamron 10-24mm f/3.5-4.5 Di II VC HLD has improved optics, a 4-stop VC (Vibration Compensation) system, and a new HLD (High/Low toque-modulated Drive) autofocus system. Handling is improved as the focus ring no longer rotates during autofocus and enables full-time manual override. Weather-seals are also added, plus a fluorine coating on the front element to repel moisture and aid cleaning. Image quality is very good and, overall, it’s simply the best choice for an APS-C format ultra-wide zoom. The Sigma 8-16mm f/4.5-5.6 DC HSM offers an even wider maximum angle of view, but has a built-in hood with no filter thread. For extreme viewing angles, the Sigma 14-24mm f/2.8 DG HSM | A doesn’t go quite as wide as the EF 11-24mm f/4L USM zoom, nor Sigma’s acclaimed 12-24mm f/4 DG HSM Art lens, but it comes pretty close – and is only about half the price of the Canon. The Sigma 14-24mm f/2.8 DG HSM delivers stellar sharpness across the entire image frame, even when shooting wide open at f/2.8. Distortions are incredibly minimal for an ultra-wide zoom, and color fringing is absolutely negligible. The top-performance optics are wrapped up in a superbly well engineered and fully weather-sealed barrel. This relatively new lens has become our favorite ultra-wide zoom for full-frame DSLRs. Canon’s own top-flight 70-200mm f/2.8 zoom has recently had a minor update, but the second generation of Tamron’s equivalent lens – the Tamron SP 70-200mm f/2.8 Di VC USD G2 – is a major revamp, and something of a masterpiece. The optical path, autofocus system and image stabilisation all get significant upgrades, and the pro-grade, weather-sealed construction features a keep-clean fluorine coating on the front element. Image quality is stunningly good in all respects, with terrific contrast and sharpness even at f/2.8. Autofocus is super-fast and extremely accurate, and the image stabilisation system gives a class-leading 5-stop benefit, as well as having three switchable stabilisation modes to choose from. We actually prefer it to Canon’s own lens, and it’s much less expensive to buy. Think 70-300mm lenses with a variable f/4-5.6 aperture rating, and you’re probably thinking of a budget telephoto zoom. The Canon EF 70-300mm f/4-5.6L IS USM lens is about three times the price of most competing lenses, but as one of Canon’s L-series models, it’s better built with a solid feel and a set of weather-seals. The autofocus system is rapid and the image stabilisation performs very well, but what really sets this lens apart is its top-notch image quality. Sharpness remains excellent throughout the entire zoom range, which gives generous telephoto reach on a full-frame camera, and an effective range of 112-480mm (in 35mm terms) on an APS-C body, breaking into super-telephoto territory while maintaining a relatively compact and lightweight construction. Sigma and Tamron both manufacture 150-600mm super-telephoto lenses, enabling serious reach, especially when mounted on APS-C format cameras, where the maximum effective focal length becomes an incredible 960mm. The Sigma ‘Sport’ line lens has the edge in terms of image quality, with excellent sharpness throughout the entire zoom range. Autofocus with the Sigma 150-600mm f/5-6.3 DG OS HSM | S is very fast and highly accurate, and the dual-mode Optical Stabilizer is highly effective for both static and panning shots. Build quality is of a pro-grade standard, with a weather-sealed metal barrel and even a tough, metal hood. The only downside to this Canon camera lens is that it’s a pretty massive lens and, at nearly 3kg in weight, it makes prolonged handheld shooting a challenge. Smaller, nearly a kilogram lighter and much less expensive, Sigma’s ‘Contemporary’ class option has the same zoom range as its ‘Sport’ sibling but is much more manageable in the hand, and easier on the wallet. It still has a weather-sealed mount, but lacks the Sport's more comprehensive set of seals. It’s not quite as sharp either, but still performs well and is great value at the price. Tamron has something of a history of making groundbreaking superzoom lenses. The company’s latest offering, the Tamron 16-300mm f/3.5-6.3 Di II VC PZD Macro, is an 18-400mm lens that really pushes the envelope at the long end of the zoom range. However, the previously released 16-300mm is a class leader in wide-angle coverage, shrinking the minimum focal length to just 16mm. The extra-wide maximum viewing angle can often be more useful than extra telephoto reach. Colour fringing and distortions can be quite noticeable, which is typical for superzoom lenses, but sharpness is better than usual and handling is good. The VC system is very effective too, which is good news as the effective maximum focal length of this APS-C-format lens is 480mm. You usually need to choose between a really wide aperture or image stabilisation, but the Canon EF 85mm f/1.4L IS USM gives you both. The combination of an 85mm focal length and f/1.4 aperture is perfect for portraiture on a full-frame camera, enabling a comfortable shooting distance and a tight depth of field for making the main subject really stand out against a blurred background. Better still, the image stabilisation enables consistently sharp handheld images even under dull ambient lighting, for wonderfully natural portraiture indoors or at twilight, without the need to bump up your ISO setting or resort to flash. The lens also does well shooting against the harsh glare of the sun, with a high-tech ASC (Air Sphere Coating) to minimise ghosting and flare. This recently launched lens has fast become Canon’s full-frame tool of choice for high-end portraiture. Like Tamron’s recent ‘G2’ lenses, this is the second generation of the company’s 90mm VC USD macro lens. As such, the Tamron SP 90mm f/2.8 Di VC USD Macro features a host of upgrades included improved optical performance, nano-structure coatings, weather-seals and a fluorine coating on the front element. It also adds a new ‘hybrid’ image stabiliser that counteracts horizontal and vertical shift, as well as the more usual angular vibration or ‘wobble’. This makes stabilisation much more effective in close-up shooting and, in this respect, the Tamron directly matches Canon’s esteemed EF 100mm f/2.8L Macro IS USM lens. It also performs every bit as well in terms of handling and image quality but, at only around two-thirds of the price, the Tamron is the better buy.